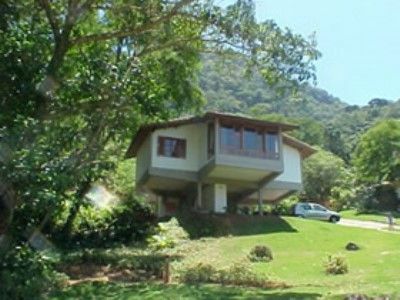 Sitting in a 125,000 ft area, entirely surrounded by the native Atlantic forest and with a dazzling ocean view, the Ilha de Toque Toque Bungalows is the ideal place for who seeks tranquility, harmony with the environment and comfort. There is only two charming and large bungalows, and four apartments, 300 meters away from the beach, all with an ocean view. Come and enjoy this piece of paradise! Bungalows with private rooms, kitchen, large garden, varandah with barbecue place, private parking, double beds, internet wi-fi, satelite 21 inch tv, dvd with mp3 player, ceiling fan, complete kitchen, electronic safe, hair dryer, exclusive Natura ammenities and dazzling ocean view. Casa com dormitórios e banheiros grandes, confortável. 15 minutinhos de caminhada até a praia. Agradecemos a preferencia e sejam sempre bem vindos em nossas instalações. The Bungalôs sit on a hilltop just off the Toque Toque Grande beach. Only 3 hours away from São Paulo the pitoresque fishermen beach, whose canoes can be seen stranded on its soft and white sand, is very preserved. Most of the year its waters are calm and clear. Only 10 minutes from the Inn there are beaches, waterfalls and treking paths. At a 20-minute walk is the dazzling Calhetas beach. The Ilha de Toque Toque, is only Inn of the localities and within a six kilometres ray.